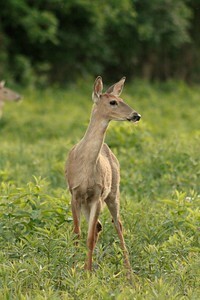 One of the largest and most common wild mammals in southwest Ohio. 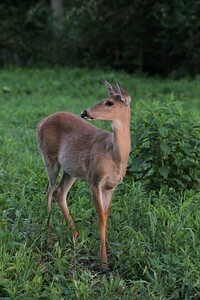 The white tailed deer is a common resident of woodlands and forests. 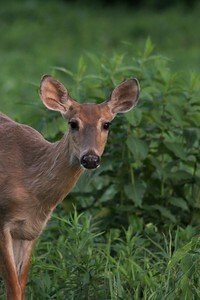 Being able to capture them up close is a challenge as they have excellent hearing and solid eyesight. 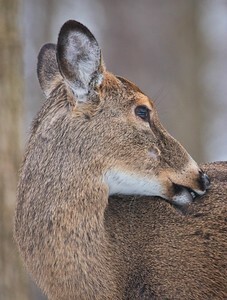 While I typically go out on a shoot with birds in mind, I will usually end up finding deer one way or another. 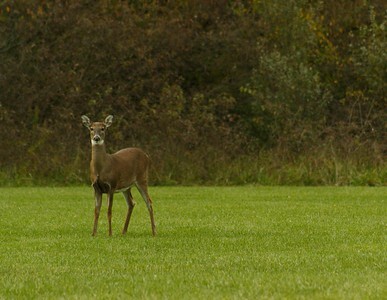 Creekside Reserve, Beavercreek, Ohio "Going to the woods is going home. - John Muir Life throws many surprises. Cycling along the bike path with my old camera bag with me. To the side for a good mile is the Creekside Reserve. 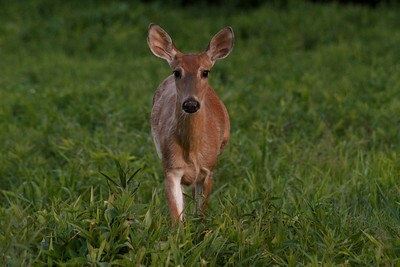 This was taken at dusk when white-tailed deer are out in the open the most. I stop to my amazement that there is at least eight to ten of them grouped together by the treeline. Easily the most I've seen in a single space. Armed with a 75-300mm zoom, I zoomed in at 120mm, using an f-stop of 6.3 to distance these two away from the background more as a portrait. Then with a shutter speed of 1/200 second handheld, and ISO 800 to keep up with the darkening skies. © 2017 Ryan L. Taylor Photography. All Rights Reserved. Creekside Reserve, Beavercreek, Ohio © 2017 Ryan L. Taylor Photography. All Rights Reserved. Fairborn Community Park, Fairborn, Ohio © 2017 Ryan L. Taylor Photography. All Rights Reserved. Sweet Arrow Reserve, Sugarcreek Township, Ohio This was taken on a frosty and chilly October morning. 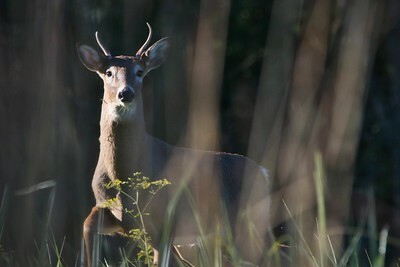 I was not surprised to see deer left and right at time during the rutting season along the trails. After having just spent about an hour grabbing some successful captures of Eastern Bluebirds out in the prairie. I wandered off to another area downhill from the prairie. Off to the side this single deer was already staring me down. 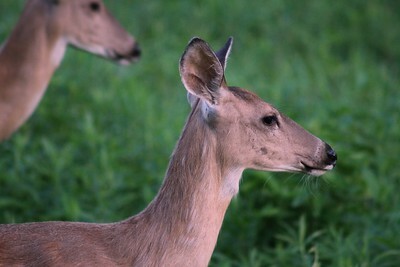 This is actually the first deer I've seen that had its antlers growing in. Shall we call it a young buck? 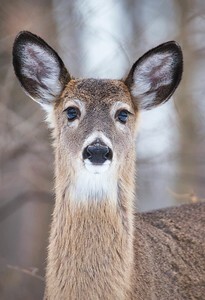 White Tailed Deer have superior hearing compared to humans. I have tried very hard to be still and gingerly walk and have still been spotted from over a hundred yards away! More often than not, they spot me before I see them. 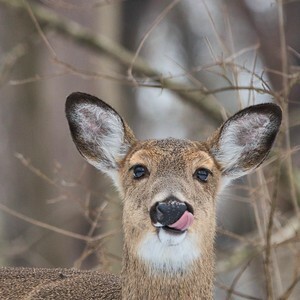 I enjoy the sidelighting on the left, illuminating the side of the face and detailing just enough of the deer to reveal the subject. Even previewing the shot on my DSLR in the field made it clear that black and white was preferable over color. I held this worried mammals attention for about two long minutes before it loudly hissed and hurried off into the nearby woodland canopy. © 2018 Ryan L. Taylor Photography. All Rights Reserved. Creekside Reserve, Beavercreek, Ohio © 2016 Ryan L. Taylor Photography. All Rights Reserved. 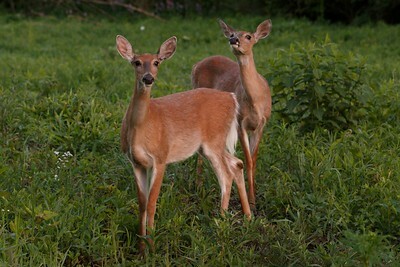 Creekside Reserve, Beavercreek, Ohio "Heaven is under our feet as well as over our heads." 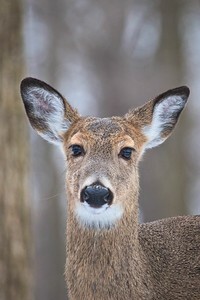 - Henry David Thoreau In terms of Southwest Ohio, White Tailed Deer are perhaps the easiest mammal to begin photographing in the wild. They're very large compared to most mammals. You will find them almost anywhere there is woods (deer do not like areas that are too wet however.) And with enough patience, you can grab a decent capture or two if you see them before they see you! 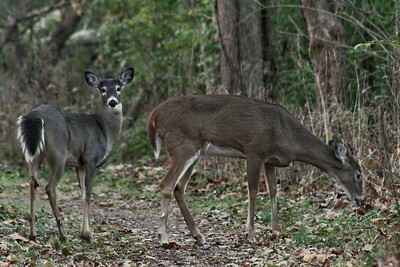 Nothing is better than a candid shot of the foraging or walking along, without distressing them of your presence. My favorite spots to find them easily are here at Creekside Reserve as well as Fairborn Community Park, although I have spotted them in a dozen other locations. 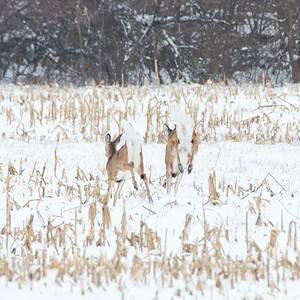 This photo is an inspiration and exercise in how wildlife can be camouflaged in their environment. Inspired by Art Wolfe's book Vanishing Act (a must read in my opinion), I wanted to have the subject become almost removed from being clearly in focus and prominent in the frame. 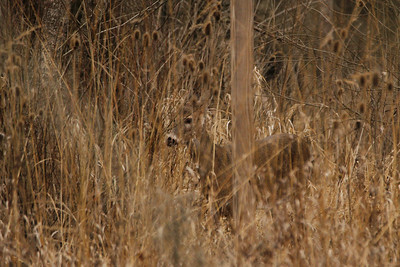 The way this deer's dusty brown blends in with the dry wintertime grasses is simply perfect. The goal was to show the animal in its habitat without disturbing it. 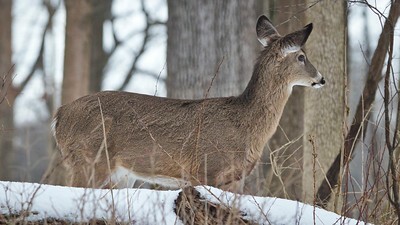 The pole that the deer is behind is actually from a bird nest box. This image was taken from across the Little Beaver Creek at an overlook of a field of nest boxes. At first I was spending a moment just looking out at these nest boxes with my binoculars looking for any nesting birds. Then I started to see movement from beyond them coming towards me, as you can expect, this single deer crept on out from brush and grasses. I have found that deer typically will follow alongside the Little Beaver Creek or any water source like this. © 2018 Ryan L. Taylor Photography. All Rights Reserved. 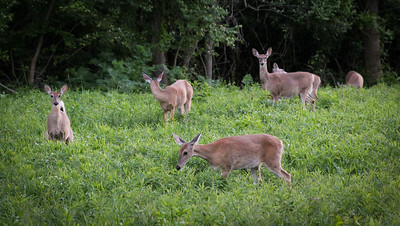 Creekside Reserve, Beavercreek, Ohio Some say that overpopulation of deer is a bigger threat than climate change. © 2017 Ryan L. Taylor Photography. All Rights Reserved. 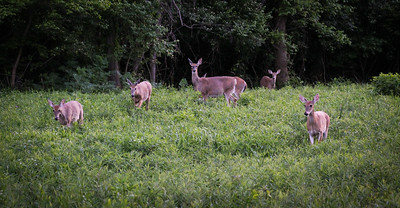 Glen Helen Nature Preserve, Yellow Springs, Ohio Only a few feet away off the trail, these deer stared back and forth at me while foraging for food before slowly moving on. They did not seem deterred by my presence. © 2019 Ryan L. Taylor Photography. All Rights Reserved.